So you know that some pretty nasty stuff goes on at so-called factory farms. (If you don’t know, please watch Food, Inc. because even though you don’t want to know….. you really DO want to know. And if you’d like a short piece of the film about chicken farms, you can watch one here.) We have not eaten beef or pork for a very long time, and further decided to only eat ‘clean’ chicken and turkey. Well, as I’m sure you all know, ‘clean’ poultry costs a lot more. We have 2 solutions for this. 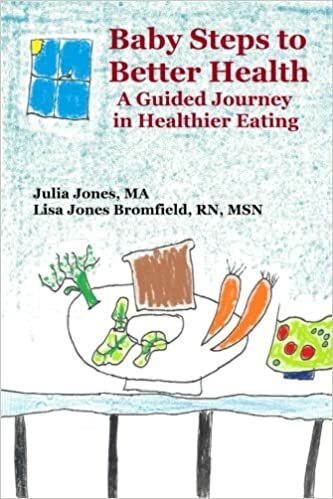 We eat less meat: less often, and less of it on the plate when we do it eat it, and I buy whole chicken and make soup after an initial meal or two from the roasted chicken. It’s really not that hard and there is nothing like homemade soup, so if you’ve never done it, here we go….. from raw to roasted to really delicious soup! ‘Uncaged’ or ‘cage free’ only means that there is a door somewhere in the hen house that the chicken could in theory use to go outside. They can still be crammed into a very small and unhealthy space. All-natural diet could mean just about anything. Chickens eat bugs. Chickens that run around eat bugs! If you don’t have a Farmer’s Market then check out your options in the grocery store. If you aren’t going to roast your chicken that day or the next, freeze it. Just remember to thaw it by taking it out of the freezer and putting it on the counter the morning of the day you will cook it. I have not had much luck de-frosting chickens in the refrigerator – it takes a very long time. 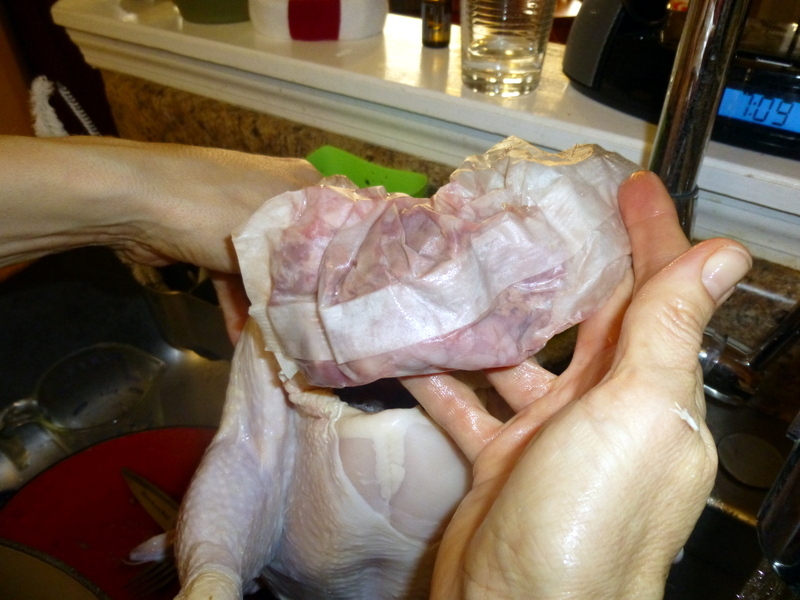 Un-wrap and rinse your chicken a couple of hours before dinner time. I place the trash can right by the sink so I can put the wrapping plastic in without dripping all over the floor. Many chickens come with the giblets (organs that some people like to eat like the heart, liver, and gizzard) tucked inside the bird – sometimes in a paper or plastic wrapping. Pull out the bag. 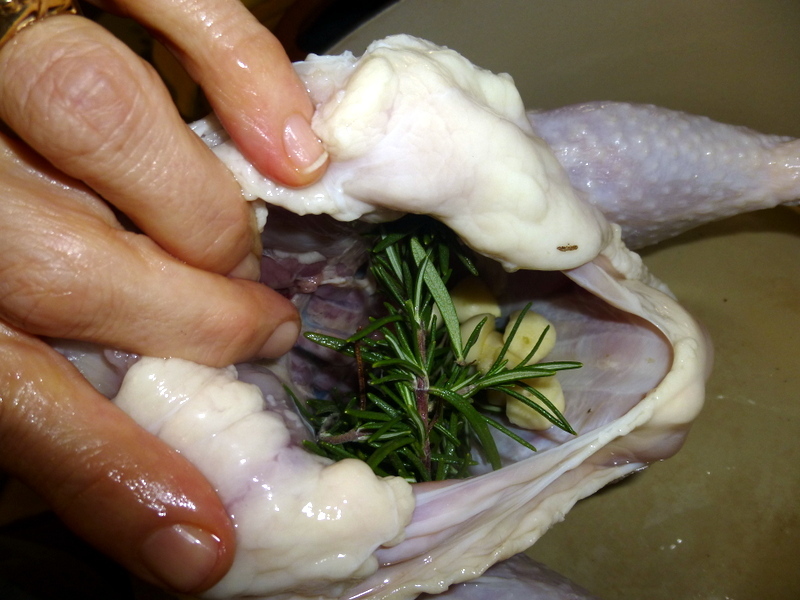 You can cook the giblets in a small pot covered with water and then eat them directly, chop them for use in the soup, or feed them to the dog. I do not put them in the soup because my son will not eat it when he notices the brown pieces that are of a different texture than the rest. My Mom (and Little Sis before she quit meat) loved them fresh out of the water with some salt. At any rate, you don’t want to leave the plastic or paper bag full or organs inside the bird! Then you will rinse off the chicken inside and out. It can seem gross the first time you do it, but kind of only fair to be aware of the process if you are going to eat the creature, don’t you think? Salt and pepper the outside of the bird and you can rub a little oil on the outside of the bird if you like. This makes the skin crispy. I don’t eat the skin so I don’t worry about oiling the outside. I also stuff some herbs into the body cavity to add flavor to the roasted chicken and to the soup. There are lots of fancy ways to stuff herbs under the skin, lots of fancy rubs you can make or buy, and all of these are fine. I am just giving you the quick and easy approach. 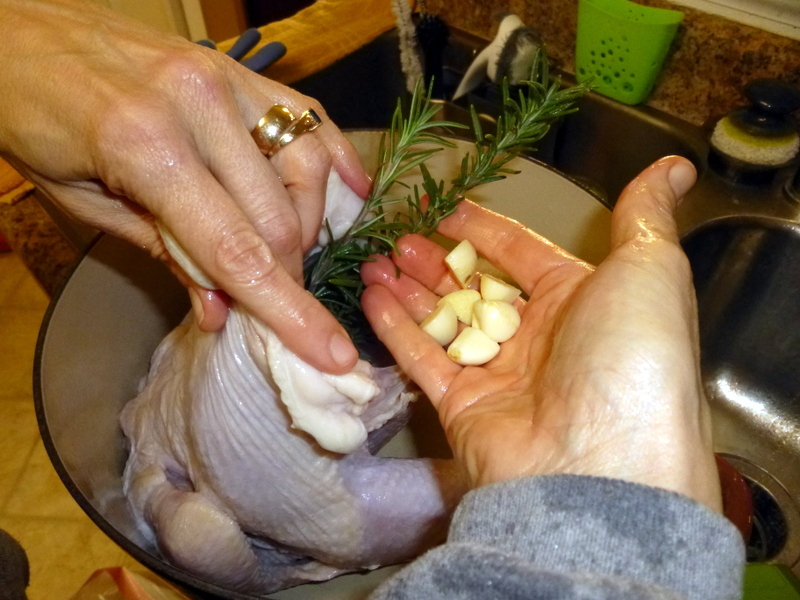 I use raw garlic (about 6 cloves peeled and chopped in half) and a big sprig of rosemary. You can also toss in a handful of dried oregano or rosemary. Then wash your hands thoroughly along with anything else touched by the raw chicken or your chicken-y hands. Salmonella is NOT fun. Wash! 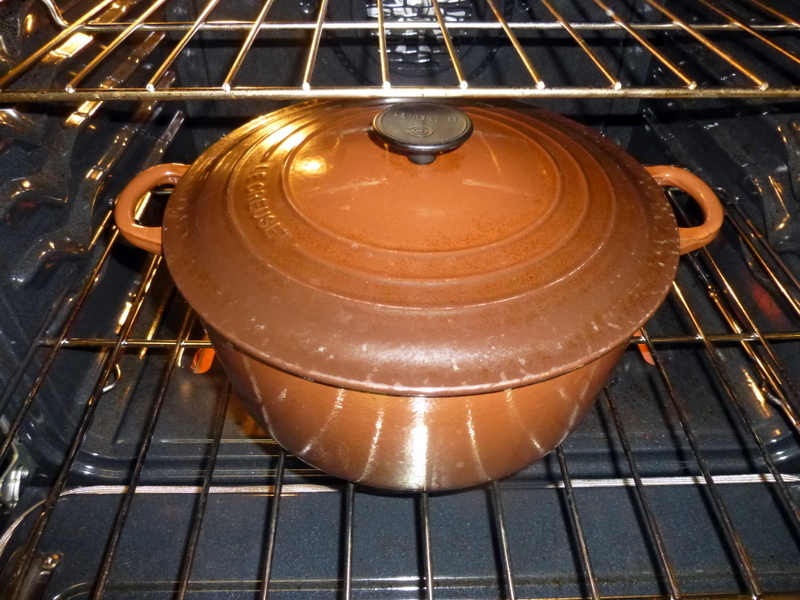 Into a roasting pan…. or a pan covered tightly with foil at 350. An incredible pot so generously given to me by Little Sis. I love it! I roast my chickens upside down because I think it makes the breast meat juicier. This is not necessary, but just so you know. The usual way is breast side up. The breast side is rounded and the legs will be pointing up. If you decide to cook breast side down, you will not get crispy skin unless you flip it and remove the top after about an hour and let it finish cooking the normal way. Some organic birds do not have timers. A meat thermometer is a good idea when you don’t have a timed popper. 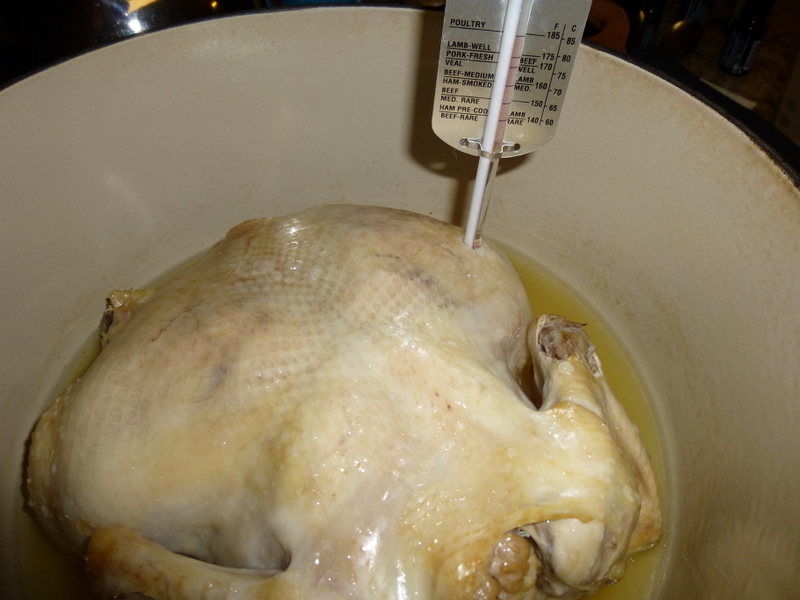 Safe temperature is measured in the chicken thigh at 165. A roasting chicken usually takes between one and 2 hours depending on how large it is. It is okay if it sits ready for a little while before you eat. The USDA says a 5 – 7 lb. chicken takes 2 – 2.25 hours to cook. I believe that is an uncovered time because my covered chickens which are usually more like 4.5 lbs are usually done in under 1.5 hours. Organic chickens are usually a little smaller because they are not given stuff to make them grow abnormally fast and are not selected for abnormally large breasts. Let the chicken rest for 10 – 15 minutes and then you can carve some meat for dinner. Carve the rest when you are done and store it, leaving a bit of meat on the bones for the soup. At this point, you can either pour the grease out into a separate container and put the chicken back in whatever you plan to make soup in. 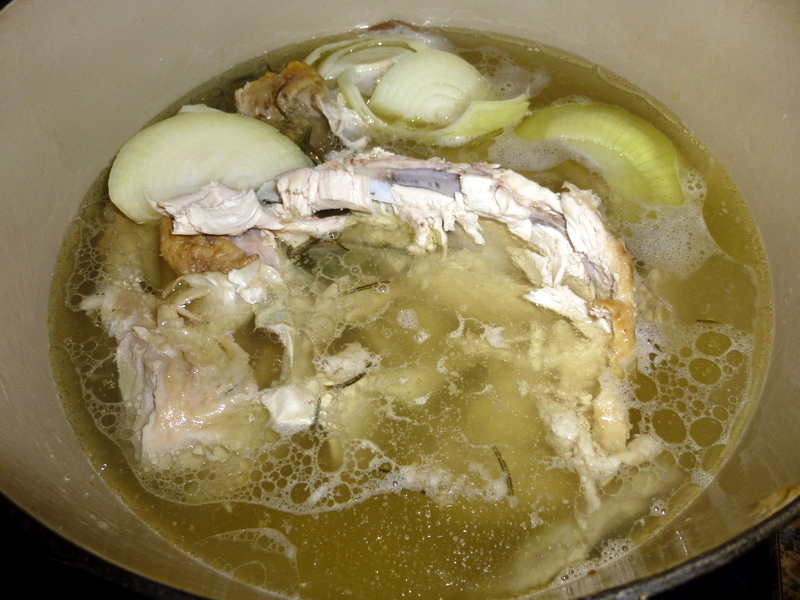 I am lazy so I just leave the chicken and the drippings in the same pot, cover the carcass with water, add 1 peeled and roughly chopped onion, a couple of bay leaves and bring to a boil, then simmer for about an hour, covered. Then let it cool and just before bed, put the soup away somewhere cold, be it the frig or the garage if it gets below 42 in your garage and you can wait until the next day -or for a few days until you have time to make the soup. 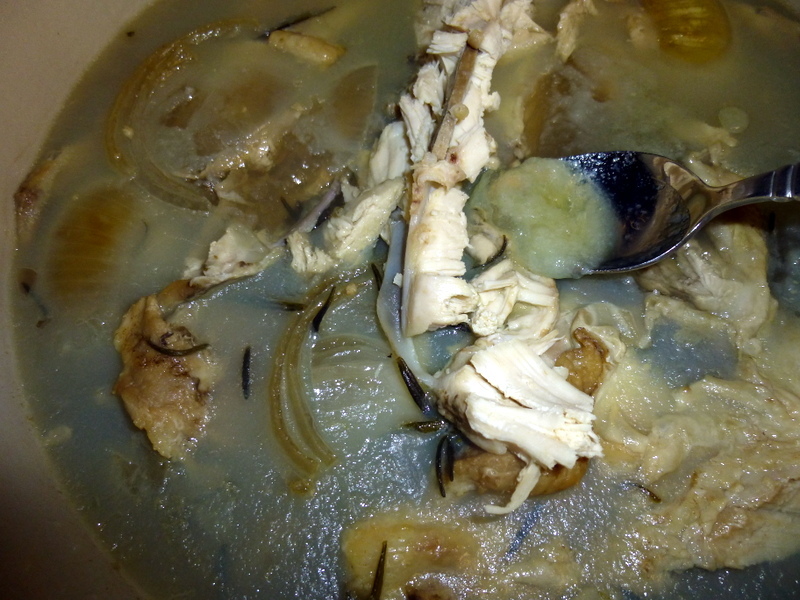 If you poured off your grease, scrape off the hardened fat from the top and add the gelatinous stuff below to the soup pot. This stuff becomes liquid again with heat. If you cheated like me, simply scrape as much of the fat off the top of your chilled ‘soup’ as you can. Then comes the time consuming part. Picking the chicken from the bones. Warm it up so you don’t freeze your fingers off and so the broth liquifies and doesn’t cling to the bones so much, but not so warm that you can’t handle the chicken. I wear dishwashing gloves which I wash well first and after. Put 2 bowls right next to your soup pot and pick up some chicken and dump bones, skin and tough stuff into one bowl and the pieces of meat into the other. Make sure that you sift through the liquid with your hand or a long handled strainer to make sure you get all the bones out. I do not exclude the rosemary, garlic or small pieces of onion, but I don’t spend time trying to pick them out of the throw away pile either. Do keep an eye out for, and remove the bay leaves, they are very rough on a digestive system! At this point I usually add 2 – 4 cups of water and some bouillion. I make bouillion from this recipe because the good stuff without chemicals is kind of costly at the store. Ironically it is a vegan stock powder, (I hope Somer won’t mind my sharing it in a meat recipe) but again, I am most concerned about clean, and I can buy very large containers of these ingredients on-line and make cheap bouillon for use in soups, stews and cooking rice. Use your choice of bouillon per directions of how much to use per cup. Now is the beauty part of making soup. Although I almost always include carrots and celery, it is not a disaster if you don’t have them. Chop about a cup of each or either and add whatever else sounds good to you. If you want rice in your soup, add that first, bring to a boil and let it cook for about a half hour before adding veggies. Root veggies like carrots, potatoes, turnips, and parsnips should go next as they can take longer to cook. Toss your celery in 10 minutes later and save things like peppers, spinach, chard, frozen peas, green beans and tomatoes for later as they don’t take long. You can put in noodles but only put them in with enough time for the noodles to cook or they become very soggy. Shoot for 1 cup of the stock veggies like carrots, celery and potatoes and 1/2 cup of other items (although greens diminsh so much you will probably need 3 – 4 cups to feel there is anything in there! 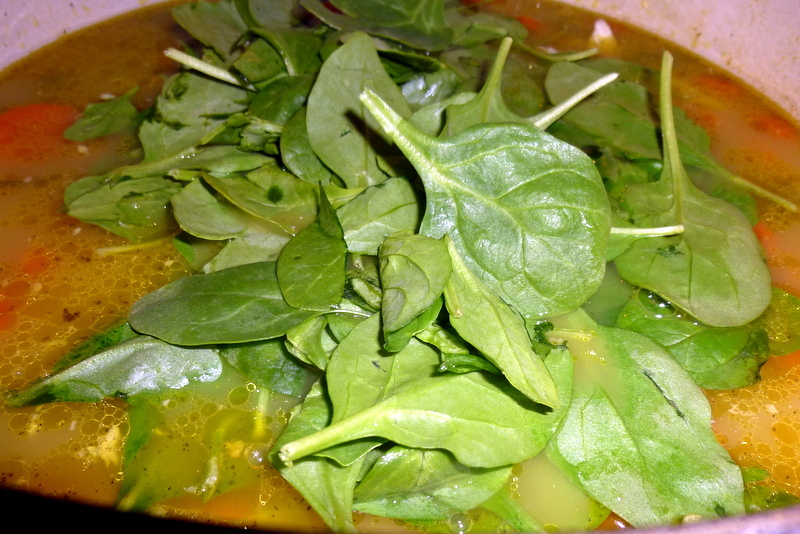 If you think your soup has gotten too thick, add some more water and bouillon. Give it a taste. 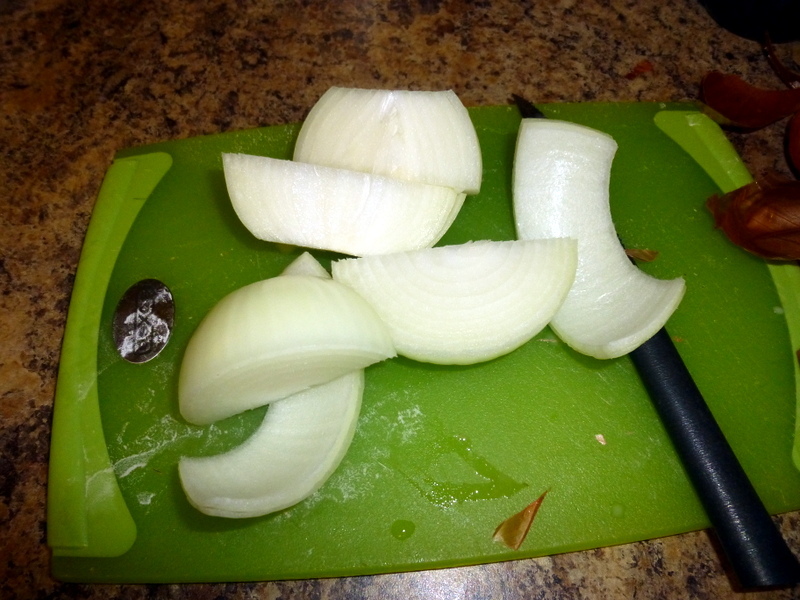 If it needs a little more bouillon, then add some more, or a teaspoon of salt at a time. I like to add a bit more fresh rosemary (about 2 tsp) and the juice of 1 lemon. The lemon gives it a stronger flavor. It is whatever you have and whatever your people will eat! love the steam showing on the left side of the pic. Mmmm warming. Like anything else, it gets much easier after you’ve one it a few times. Canned soup is full of extra salt and chemicals. 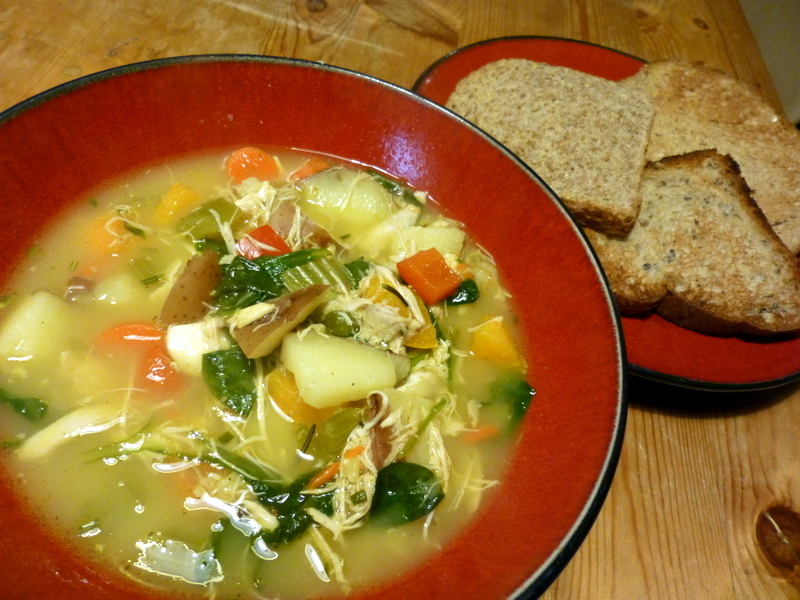 It can’t compare with homemade, and a pot of soup really stretches out the dollars for using chicken that is raised humanely, safely, and ecologically. win-win-win-win. If you are already a soup maker, we’d love to hear your favorite or secret ingredients! We do the same thing with our chickens. It’s a great cost saving way to use the whole bird for everything, roast to stock. It really saves a lot and is so nutritious! Thanks for stopping by Nicky! oh!! I want to eat!! like chicken! !Especially the soup taste!! OMG!! some water out from my mouth! It really is good, isn’t it? Feels good. My favorite meal to cook/eat Roast chicken, My 2nd favorite..chicken soup!!! yum! I have also found it to be a lovely meal for guests because it just isn’t done as frequently. Nice to have your 2 favorites in the same week! That is too cute. I had a similar experience popping corn for a kid who came over to play. He did not believe that it was possible to pop corn kernels in a little oil on a pot on the stove. He was so delighted that it worked! I agree Erin. It tastes and feels good!